No one knows how better to view cherry blossoms than the Japanese. They practically make it an art form; where else in the world do you know of people deliberately seated in on mats to have a picnic under the cherry blossom trees. And they take it really seriously too – go too late and you’ll have difficulties finding a good spot as they’ll all be taken. With the art of hanami taken to a different level by these otherwise restrained and disciplined folks, you know that if there’s one thing that they take really seriously in Japan, it’s their cherry blossom. And they are so serious about it that there’s a list of the best places to view cherry blossoms in Japan. But honestly, during the right season, you’ll find them at every corner you turn. What makes this list though are places where there are blooms as far as the eye can see and they are placed against magnificent backdrops; and this is how I found myself at Hirosaki Park, hoping to catch a glimpse of the cherry blossoms where the Japanese said I would be able to best view them. First off Hirosaki can be considered off the beaten path – not for domestic tourists who are well-attuned to the best that their country has to offer, in part thanks to the well-developed rail system – but for the foreigners who throng Kyoto and Tokyo during this time. The season that the flowers bloom is also atypical. Japan being a really long country means that spring starts at different times of the year in different prefectures and for the Tohoku region (which literally translates to North East from Japanese), this takes place from the end of April to early May. And the prefecture that you’ll find Hirosaki – Aomori. Cherry blossom season at Hirosaki is a huge deal, and posters are done up to share the festival that takes place there. Literally everyone in town is there just for the cherry blossoms. Case in point, step out of the station and you’ll be ushered by the many enthusiastic locals on where to go and what bus to take to get to the famed grounds of Hirosaki castle, which is where the main fanfare takes place. And for these parts, they have English speakers covered. My tip is to always ask about at the tourist information centre at the train stations: this is where you have the highest chance of finding someone who will understand you and have all the information to your questions. It’s also where you will get a good English map of the festival. 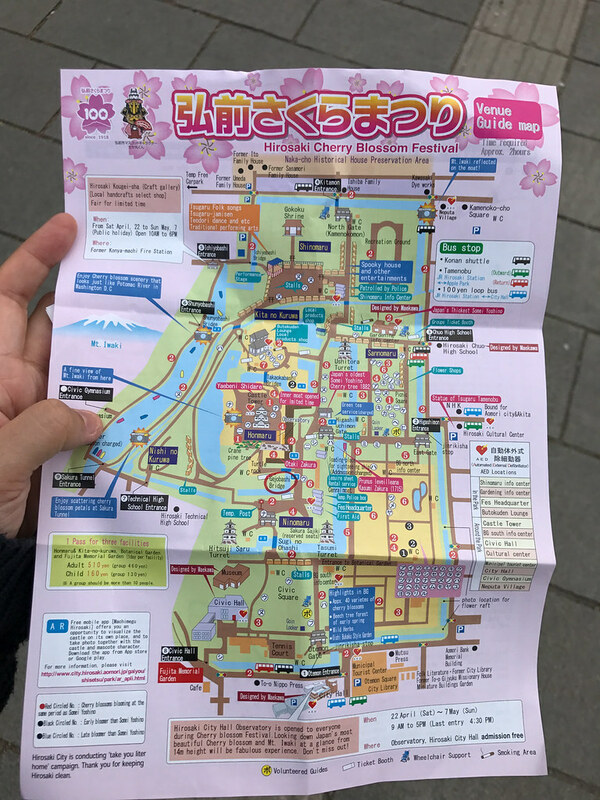 The one that you get in Hirosaki is pretty good, it covers the entire park, includes what type of cherry blossoms you’ll see at each spot, and even includes a short description of the main types of cherry blossoms. There won’t be space for all of them; there are reportedly more than 50 types of cherry blossom in the park, and that will take quite a few pieces of paper. The other good thing about cherry blossom viewing in these parts, unlike in Tokyo and Kyoto, where admission fees are necessary for the temples and parks that are said to have the best cherry blossom viewing experiences, in Tohoku, most of the best places are free; this applies to for Hirosaki, save for some selected parts of the park, but trust me that they will more than suffice. One of the key highlights in a photo with cherry blossoms draping the majestic Hirosaki castle that is the centrepiece of the park. However as the castle and the surrounding stone wall is undergoing some well needed restoration works, the castle has been moved and shots of it with the iconic red bridge are somewhat impossible. The works are going on for about a decade, but the plus point is that you can now take a photo of the castle with Mount Iwaki in the backdrop, something that wasn’t possible previously. Entry to the area where the castle is requires an entry fee. And due to the abovementioned move, the castle cannot be viewed without payment of this ticket unlike before. If you want to see it at sunset, payment is unavoidable, and they man it strictly at every possible entrance. Here’s a tip that I highly recommend that you follow: Go early in the morning. I woke up with the intention of heading in before sunrise to capture the glorious sun. That, unfortunately, did not happen, but I still did get out early and manage to nearly have the park to myself. Nary a person was thronging the area like it was the day before when I visited, and I got to savour the beauty of the blossoms in tranquil peace. The other bonus: entry to the area that the castle stood at for free. I was there before the ticketing guys started even started work, and as this is a park for the locals too, many of them were there to do morning exercise too, facing Mount Iwaki, which meant that weren’t many camera-toting tourists aside from me in that area in the morning. But to be honest, every corner of the park is really pretty and photo worthy. As like every place with cherry blossom festivals, food and stage performances are a must, and that’s the same for Hirosaki park, just that it’s massive, taking the sides of many massive grounds that are in the park, selling all sorts of delicious Japanese street snacks. The place really comes to life at night though, as all manners of Japanese people come here to hanami (flower viewing). My favourite sight from being at Hirosaki: witnessing the petal storm that is Sakurafubuki; also known as a cherry blossom blizzard. I had never seen this side before, but a photo of this was what really drew me to Hirosaki and I count myself lucky to be able to witness the sight as it’s about being at the right place at the right time, and with limited time in Japan, I was lucky to be there when it’s happening. So my favourite scene: A pastel pink petal-filled river with overarching cherry blossom trees that still have blooms on their branches. How beautiful this is, photos cannot capture, you really have to see this in person. And really because of how many cherry blossom trees that you need to have clustered together to fill the river with floating petals, it would be to me a sight that you can only get to appreciate the fullness of how beautiful in Hirosaki. How amazing that you got to experience this in person! Your photos are stunning, I love the soft pink against all the different backgrounds. I’ve been to Japan but never during cherry blossom season and would love to go see them. Thanks! Am glad that you liked the photos. The park was amazing because of so many different backgrounds in one place. Cherry Blossom in Japan is something I personally highly recommend. No other place can really beat it. As a big fan of cherry blossom I was happy to read and see all your beautiful photos! I have been to Japan for the Hanami season in 2014 but we when we visited Hirosaki park we were a bit too early but we saw some small plum blossom. Now seeing all your photos of this place with all the cherry blossom I am going to this evening convincing my husband that we should return to Japan next Hanami season! Yay fellow cherry blossom lover. I actually, in fact, went twice to Japan last year to different parts chasing cherry blossom. It’s a pity you were too early. If you only had a day like me, it’s best to go just after the full bloom, cos then the fallen petals will form the “pink water” that you see and all that pink is what makes it look so dreamy. Hope mission go to Japan for hanami is successful. Do keep me updated! Don’t get me wrong, there are still many tourists, but pardon me if I may, much less Caucasians than Kyoto per say. Summer in Japan is lovely too, but nothing beats spring for me! Japan is such a fascinating country! They have some many original place to see, event to attend and stuff to do! Ive always wanted to see those wonderful cherry blossoms unfortunately I only got to see Tokyo! Your photos are stunning I hope one day ill get to return to Japan and get to see those wonderful trees! At least you have seen those and in a pinch, those in Tokyo would do. I think the best thing is there is nothing in Japan that is not delicious. Do make plans to go one day and thanks for the compliments on the photos, really appreciate it! Visiting Japan during to watch the cherry blossoms has been on my bucket list ever since I saw the Last Samurai. Your photos really capture the beauty of the spectacle, that is cherry blossom season in Japan. I’ll hopefully make my way there soon, and when I do, your recommendations and tips will certainly come in handy. A traveller like you will certainly make his way there I’m sure. Glad that you liked my photos and hope that it really inspires and helps you in getting there. Cherry blossoms and Japan go hand in hand. It is amazing that people take cherry blossoms so seriously in Japan. Cherry blossoms happen in my country India too, but not many show much interest to it strangely. I am relieved to know that information in English is available. It is amazing that admission is free, including in Hirosaki. Never knew that India had cherry blossoms. Pray tell where you can see them, please. Glad you like the read and that this encourages you to go view the cherry blossom there. I had been to Hirosaki Park during Cherry Blossoms and it looks out of the world. It’s like stepping into a dream world. Your pictures are gorgeous and brings back my old memories. They really have such an amazing aesthetic. I loved your photos, taking them early in the morning gives them a perfect light, and they are already such beautiful colors. I especially loved your insider guide, I always hear about the cherry blossoms but what are the tips to get to them!? Your post answers these questions and then some, thanks so much for writing it all out. One day I’ll hopefully visit. Glad that you liked the photos and found the info useful. Hit me up for more tips if you need help when planning a trip. Absolutely stunning pictures!! I knew they were popular in Japan but it hadn’t crossed my mind before that the parks might get overcrowded. I didn’t know that the Japanese sit on mats under the tree’s. Would love to see these one day. Check out my instagram. I’m planning to share some of those shots. THey arent’ pretty though it is quite a sight! You weren’t kidding. They seriously get into the season but I love it! I never realized how long Japan was. Also, your pictures are beyond amazing! Great springtime travel post! Haha… it is really rather long. Glad that you liked my pictures! Your photos are insane! So much pink everywhere. When I visited Japan, I just about missed the cherry blossoms and I saw all these lovely places which I had seen in pictures with cherry blossoms, and they looked so different! I have not been to Hirosaki park but I can see why you call it the best place to view the cherry blossoms. This is divine! I loved this post in pink colored flowers. Cherry Blossom is my biggest reason to visit Japan. Till now I did not know that there are 50 types of cherry blossom ? Wow . Too good to realize this. How many days you think I need to visit here? Absolutely love the magnificent shops that you have captured of the cherry blossoms in full bloom in Japan! I’ll love to be able to admire the beautiful natural landscapes for myself – I am sure it is very beautiful!